Can you believe it’s already October 1st? Christmas is going to be here before you know it. 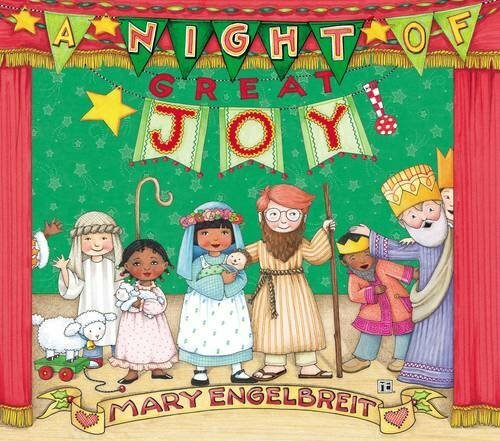 Night of Great Joy by Mary Engelbreit is a picture book that celebrates the holiday season. Perfect for babies and elementary children. The Night of Great Joy is about the night of Jesus’s birth being told by children performing a play. Children love seeing other children in stories. Mary Engelbreit did a wonderful job with using illustrations to tell the story through the Christmas pageant being performed by the children. Night of Great Joy focuses on the night of Jesus’s arrival. We see Mary and Joseph arrive in Bethlehem and look for a place to stay. We see how the north star played in helping people find Jesus. In the beginning of the book, we see a large group people arriving at a school in pouring inside to find seats. Peyton pointed out how that was just like her school choir concert! All the moms, dad, siblings and families came to the school to see a performance. As we were reading the Night of Great Joy, Peyton pointed out how it was just like the plays we go see but it was being performed by children. And she also saw Christmas traditions throughout the book. Peyton really enjoyed reading and looking the pages. I think being able to see a situation and children in a story helps her relate to the story. It felt more real to her, like this is something that could really be happening. Night of Great Joy is a wonderful book for helping get your family into the holiday mood. I feel it is appropriate for preschoolers to about 2nd grade. You can purchase a copy of Night of Great Joy online or at your local bookstore.